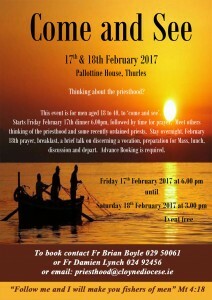 A Vocations “Come and See” event will take place on 17thand 18th February 2017 in the Pallottine House in Thurles. This gathering will welcome people from the Munster/Cashel province of Dioceses. Last year there was a very successful “Come and See” event also in Thurles, where 18 men turned up. The event runs from 6.00pm on Friday 17th and concludes on Saturday 18th at 3.00pm. Advance booking required.